Just saying | I'm just your average, gen Y kid sharing my radical perspectives on the world evolving around me…. just saying. I'm just your average, gen Y kid sharing my radical perspectives on the world evolving around me…. just saying. T.J. Maxx (T.J’s), who promise “fashion direct from designers and savings directly to you,” has definitely sparked my interested recently. About a year ago I started noticing their ads on TV coining the new term, maxxinista – a cleaver play on the word fashionista – and it got me wondering, should I be a maxxinista? Here’s an example of one of their TV spots: Maxxinista Commercial. 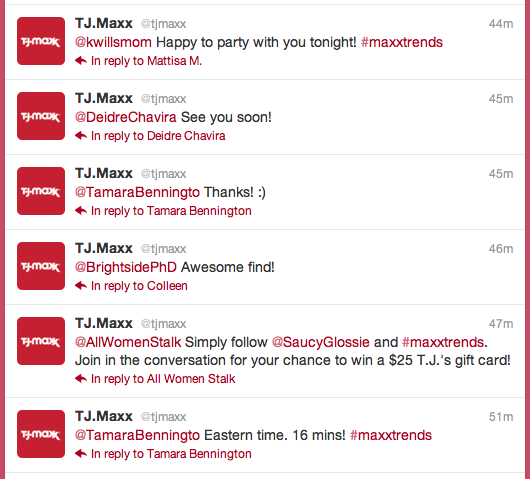 Since the Maxxinista Campaign launch in 2010, the company’s online social media presence has increased ten fold. Although I couldn’t find an exact source describing the success, there are a lot of sites (like this article) crediting the Maxxinista Campaign as one of the best. For instance Vered DeLeeuw, Social Media Consultant and Online Blogger, says the campaign “is a great example of how a brand can effectively use social media to enhance its general marketing message” and I couldn’t agree more. Twitter – T.J.’s utilizes Twitter to help narrow the gap between the company and consumers exceptionally well. Today, alone, they tweeted a total of 46 times and I only anticipate that number to continuously grow since the night is still young. As you can see in the image below, the majority of the content stems from replies to their followers. This is extremely effective for two reasons: 1. as previously stated, they are bridging the gap between company and consumer by directly interacting with consumers each and every time someone tweets at them. This also proves that they are really listening to consumers and responding to their comments. 2. By having a lot of consumer generated content, they are utilizing Twitter the correct way. Instead of trying to fit Facebook posts into a similar, shortened Twitter post they using the medium as a two-way conversation between brand and consumer. These efforts have definitely paid off; the proof is in the numbers. As of today, T.J.’s Twitter page has 6,398 tweets and 43,651 followers. 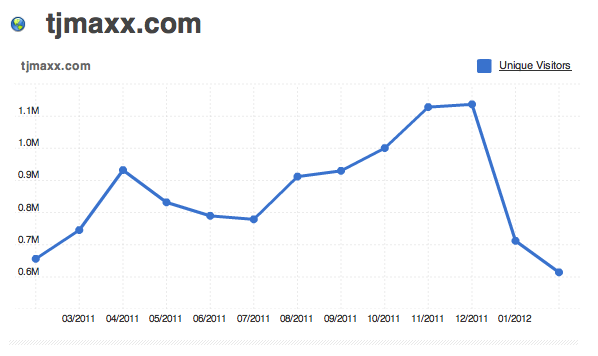 According to compete.com – the T.J. Maxx Homepage has seen an overall incline of visitors over the past year and a total of 614,756 unique visitors. The Web site also includes a Maxx Finds page that encourages consumers to post images of the products they’ve found at various stores nationwide. This is a great way to engage consumers who aren’t necessarily on Facebook and Twitter but are just as brand loyal and want to experience a similar relationship with T.J. Maxx online. But their Facebook page has, in my opinion, really launched the Maxxinista campaign. 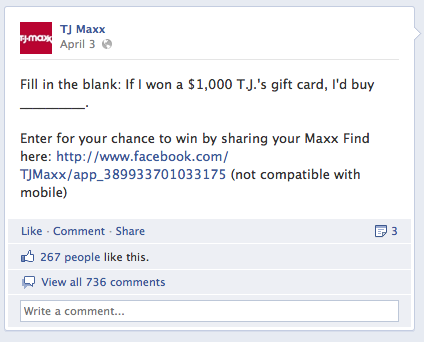 With 887,213 likes and 16,111 talking about it, T.J.’s does a great job of transferring the Maxxinista campaign to social media. 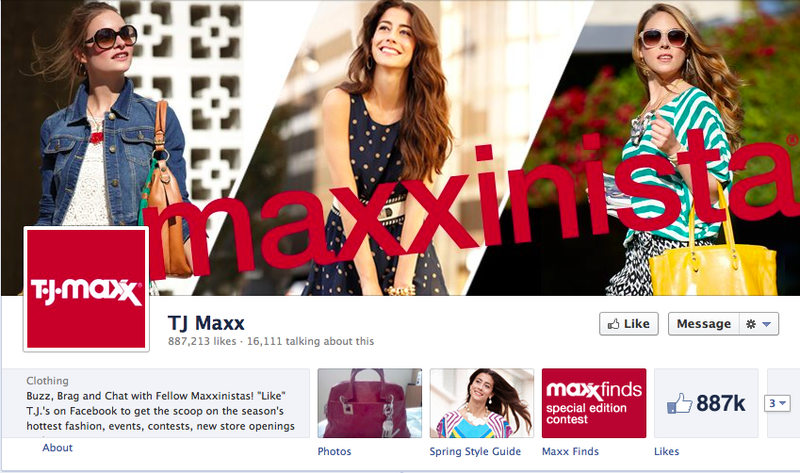 What immediately caught my attention was the Maxxinista heading at the top of the brand’s new Facebook timeline. Right away, the page invites visitors to explore “Photos,” a “Spring Style Guide” and a “Maxx Finds” located in the navigation bar. This does a great job of allowing users to explore what the Facebook page offers and eventually leading them back to the homepage. Each content category generates over hundreds of likes per post and a wide range of comments and shares. Surprisingly, the Fashinista Recommendations (which consist of advice from Fashion Stylists) generate the least customer interaction with somewhere around 100 likes a couple of comments. The Promotional Content and Style Suggestions generate the most feedback. The Promotional Content visualized above asks fans what they would do with $1,000 gift card. With the opportunity to win an actual gift card T.J.’s generated 267 likes and 736 comments – pretty impressive for a single post. 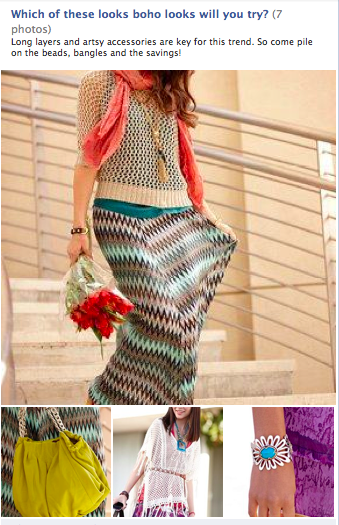 The Style Suggestion posts utilizes Facebook images to create a discussion around various seasonal styles. The example above generated 556 likes and 42 comments. Both are great examples of content that truly connects with this fashionista theme portrayed throughout the entire campaign. The content of their Facebook thrives around style, fashion and the affordable prices T.J. Maxx is known for – driving everyone to become a Maxxinista. Overall, I’ve learned a lot about how T.J. Maxx was able to converge traditional and nontraditional advertising. 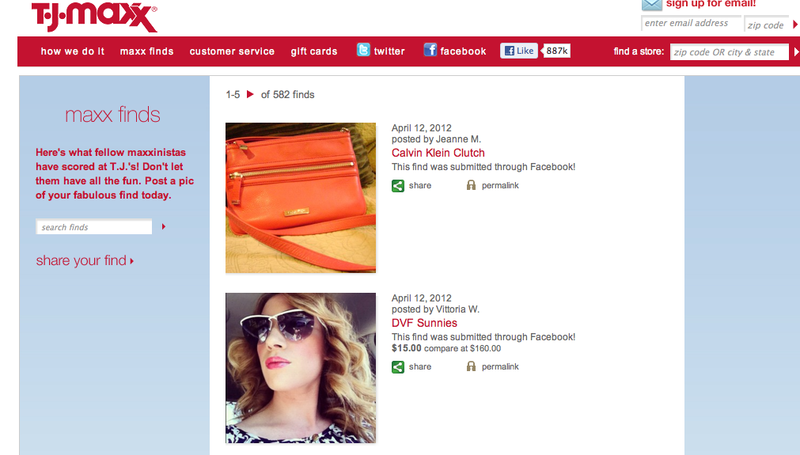 I also think T.J. Maxx has done an excellent job utilizing social media to improve a cross-channel shopping experience. With that I encourage other retailers to mimic this case study. By generating content appropriate for the various social media platforms, brands are able to create essential conversations and connections with consumers across many different online outlets. Have you ever had to sign a social media policy once you were hired? I did, for the first time last summer. All the interns were asked to read the company’s social media policy and sign a contract promising to abide by the rules. Although I didn’t think much of it then, I realized how important the policies are and how you could get into big legal trouble without one. For instance, imagine a new employee is having an awful day at work and decides to Tweet about it to his/her 500 followers. If they mention your organization or disclose information that shouldn’t leave the office walls, you’ve got negative word of mouth and confidential information that can easily reach a large audience fairly quickly. That’s why I’ve seen a relatively large spike in the number of organizations drafting their own social media policies for employees to sign. I dug around a little online and tried to find some other well written policies liked the one I signed over the summer. If you’re as curious as I am, Social Media Governance is a great resource. They have numerous company case studies available to the public for free. It was there that I stumbled across Best Buy’s Social Media Policy that was written in March of 2009 but updated about a year ago. Overall the policy stands alone on their website. A little bit lost under Community Information and Welcome/News but at least available for the public to review. Be smart. Be Respectful. Be human. This felt very real and reasonable to me. It would appear that Best Buy understands you’re human and want to talk about things online but they ask that you carry the same grace and respect whether you’re talking online, in the store, (or my personal favorite) “chatting over the neighbor’s fence.” Although the word “Twittering” (as opposed to Tweeting) worries me a little bit, within the first 2 lines I’m already complying to everything they are saying. Act responsibly and ethically, etc. I think the first two here are most important and go together. Disclosing your affiliation to Best Buy lets your followers and fans know that you’re commenting on the company as an affiliated employee. Stating that it’s your opinion is also crucial because otherwise you could look like you’re tweeting/posting on the companies behalf instead of your own. I’m not going to lie, once upon a time, I worked in retail and sometimes the customers you meet are a little crazy. If something funny happens, it’s so hard not to share with the world about the sales transaction that just occurred. But what employees fail to realize is that they are not only publically disclosing information about another person (without their consent) but also negatively portraying the customers that come into the store as weird or something. This could ultimately have a negative affect on future consumers. Bottom line is: be smart about what you share online if it has any relation to your work, co-workers or company. If not, someone will come after you. From these consquences I realized an important take-away. While social media policies are about you as an online activist with an entitled opinion, it’s more about protecting the company, customers and shareholders invested within the organization. Overall, I’d say this is a pretty sound social media policy. They cover what not to do vs. what should be done and state the consequences of not following their orders. It’s short, but sweet and lets employees know what’s acceptable and what’s not. So, make sure you read through your firm’s social media policy before you start posting inappropriate things online. Remember: protect the brand, protect yourself. Everyone has heard of TOMS shoes. Blake Mycoskie, the man who started it all, has donated over a million shoes to needy men, women and children. His simple idea of “one for one,” buy a pair of shoes and give a pair of shoes, is not only genius cause-related marketing but also provides a positive incentive to purchase the product. 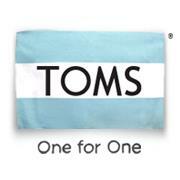 TOMS is a brand that resonates well with people and is one of the most popular shoes in the world. This year the event was scheduled for April 10, 2012 – just a few days ago. Since then, they have received lots of online media attention. Articles summarizing the day showed up on CBSSeattle.com, HuffingtonPost.com and various blogs like this one for Mall of America and Her Campus. Retailers, who sell TOMS shoes, participated in the event as well. Nordstrom’s, for instance, had an hour and a half blocked out for a sponsored awareness walk in hopes of driving sales. They had this promotional video encouraging individuals to join TOMS in celebrating One Day Without Shoes and this 2012 trailer hyping people up to participate in the event again this year. According to compete.com, in April 2011, the microsite onedaywithoutshoes.com had a total of 88,221 visitors and a total of 10,249 unique visitors. What really drove the campaign on April 12 of this year was, in my opinion, Facebook. 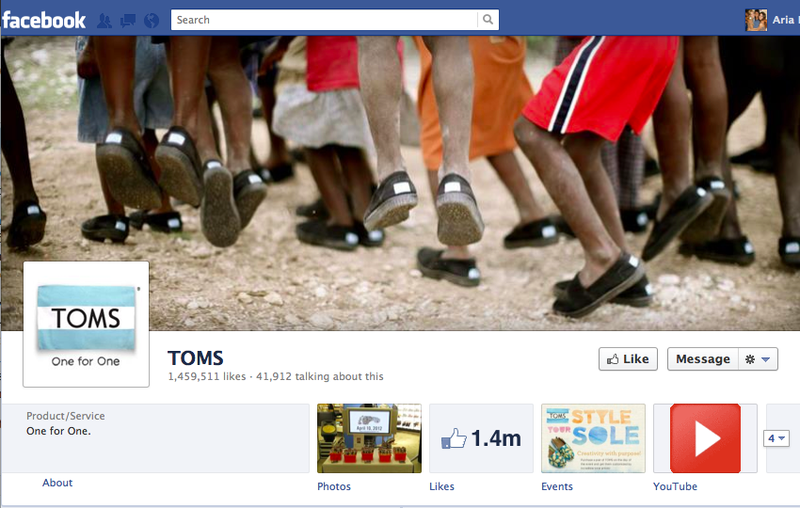 With almost one million and a half fans on Facebook, TOMS has an extremely large and loyal fan base. Over the course of the past 3 days since the event occurred, TOMS has posted 23 times on the Facebook page alone (Twitter, I’m sure, had lots more). 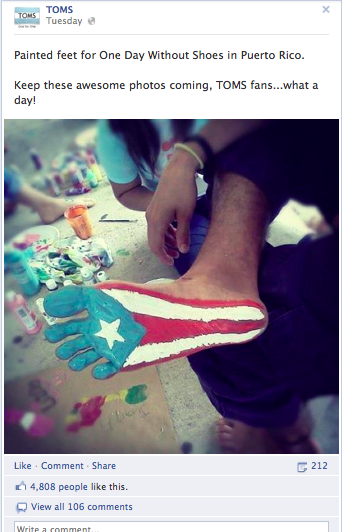 This picture from Puerto Rico generated 4,808 likes, 212 shares and 106 comments. Although you might expect that much feedback from a fan base of almost 1.5 million, it’s still pretty astonishing to generate that much discussion around a single post. This post generated 552 likes, 17 comments and 25 shares. For such a simple post, the targeted reach is still pretty impressive. Then this post was just shared just a few hours ago commending all the volunteers and compiling all the photos they recieved from participants. 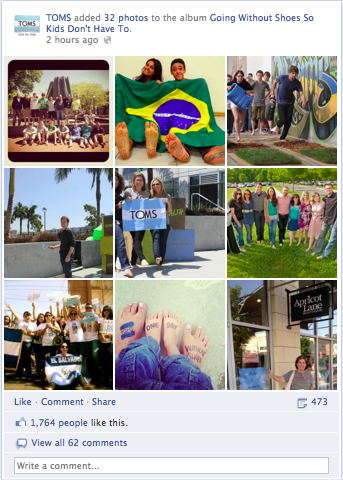 This is great consumer generated content that reinforces the brand and shows how active TOMS fans are. 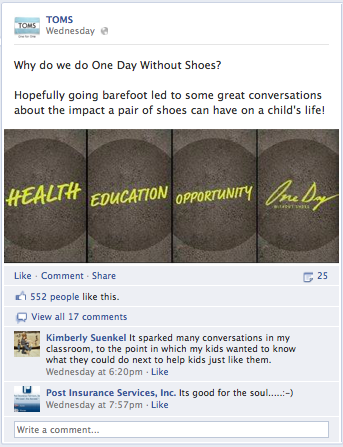 As of right now, the post generated 1,764 likes, 62 comments and 473 shares – that’s some powerful reach right there. I think all of these posts were perfect for the TOMS brand because it’s a great way to share all the people participating in the event from various parts of the world. It reassures participants that they are not alone and there are hundreds of other people doing the exact same thing. It also is a perfect testimonial to everything the brand stands for and the execution of the campaign was done flawlessly. One reason this campaign is so successful is because TOMS takes advantage of their brand ambassadors, reaches out to them to help create awareness, and essentially relies on these loyal consumers to run the One Day Without Shoes in their city. It’s a prefect example of how a brand reaches out to their loyal consumers and gives them a voice. Overall, I’ve learned how an organization turned a campaign event into a viral phenomenon online. TOMS did an excellent job transferring the awareness efforts online to reach their well-established fan base as well as introduce new consumers to the brand and their products. Facebook and work just don’t go together. Yet it’s so tempting to mix the two – so what to do? Employers claim they want your social media passwords so they can see the “real you.” Potential employees claim it’s a violation of their personal privacy. Who’s right? According to Mashable, employers in Maryland can’t demand access to private materials (like FB and Twitter passwords) as a condition of employment. Well, that’s a step in the right direction. Instead of the invasion of privacy being frowned upon, it’s now illegal in the state of Maryland. As for the rest of us? Don’t give up hope. Evaluate the situation. Is it really worth it to work for a company that wants to monitor your personal life and discover who you are based on your Facebook page? Maybe not. If that’s the case, there are always other job opportunities. Disable a public web search on your Facebook profile. * Authors note: I’m not a huge fan of this one. Especially people who change their name to first name + middle name. Unless you have a pretty unique first name, I’m probably not going to wish “Jane Marie” a happy birthday because I no longer recognize you by name. If you absolutely must change your name, at least try spelling your name phonetically. That way, people will still know who you are. What it comes down to is subjective comfort. Personally, I would have no problem allowing a future employer to take a look at my Facebook page; I don’t have much to hide. Although, I will admit, I’d find the request a little strange and probably wouldn’t disclose my password just to avoid the hassle of resetting and memorizing it – but that’s just me. If you come across this dilemma of intermingling Facebook and work, think before you respond and know that you have personal privacy rights and an opinion you’re entitled to. For more tips try reading this article. As an avid traveler myself, I love being a tourist in a new city or country. But it can sometimes be challenging when trying to figure out the best restaurants or bars to visit and the most efficient way to get there. To help me out I sometimes utilize “Places” – a location-based app that helps me find nearby restaurants, coffee, bars, attractions, ATMs, gas stations etc. But, if I’m being honest, I really only use it if I’m low on gas and need to find the nearest gas station. Today, however, a new app was just announced called MyCityWay Now and it seems to be an enhancement of other location-based apps. Mashable describes it as “a personalized concierge service for locals and tourists.” I think it’s like having a local city native in your pocket! Shop – helps shopoholics find products nearby; this section also has a Deals & Offers coupon where users can see bargains available from other social sites like LivingSocial and BestDeals. The sections that I think are real points of difference for MyCityWay Now is their Getting Around and Need subcategories. I feel as though a lot of apps have dining, nightlife, shops and tourist attraction information but sometimes all you really need is a bathroom or the airport and the fastest way to get there. Getting Around provides travelers with digital access to city maps, and bus/subway schedules that could hopefully reduce car fumes and encourage tourists to take advantage of the city’s public transportation. The Need section is also great. I swear I have the world’s smallest bladder and am always looking for a bathroom – especially one where I won’t be given the evil stare if I walk in to only use the bathroom. It’s also an added bonus that this section redirects users to the nearest ATM and WI-FI hotspots. Bathroom + cash + Internet cafes = a must-have for all travelers. The only problem I have with the app is some of the section titles. For instance, What’s On? doesn’t easily resonate with movie theatres. I mean, it does now that I read the description, but that wasn’t the first thing that initially came to mind. Titles like Travel and Need are also pretty vague. Without reading up on each category description, I could see some users getting confused with what products and services are listed where. I think if they made the titles simpler, and focused on words that summarize the information available, it could make the app a little bit better. 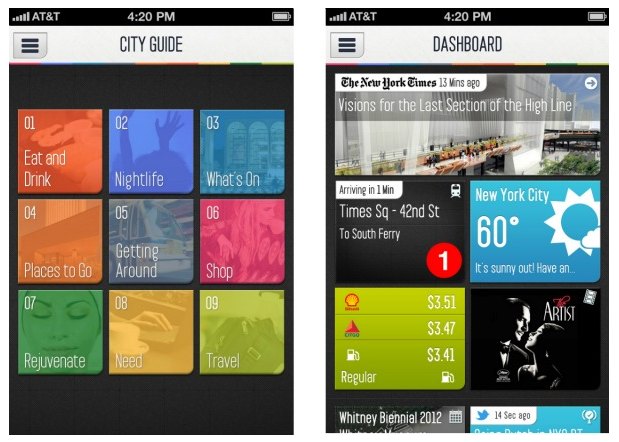 Other than that, I find the app to be a leader amongst other location-based services. It has an atheistically pleasing dashboard with services that other apps, like my “Places” Android app, currently lack. Bad news is the app will only be available in New York City on April 17th and it doesn’t mention how much it will cost. But, hopefully, they receive some positive feedback and numerous downloads so that they continue to make them for cities nationwide! Like many people, I’ve been skeptical about signing up for Foursquare since I first heard about it. Why? Maybe I’ve watched one too many Law & Order SVU episodes, or maybe I just don’t like the idea of people constantly knowing where I am. Either way, I’m slowly becoming the minority. The key difference between Foursquare and other location-based services (like Google Maps) is that Foursquare relies on peer-to-peer suggestions and reviews. Instead of just Googling what’s nearby, Foursquare allows you to visit places based on where your friends have checked-in. Where are people checking in the most? If you are a business that fits into any of these categories, I’d jump on the bandwagon and join Foursquare already. I did, and although I have very secure privacy settings, I still feel like I’m getting something out of it. Not only can I see peer-to-peer suggestions but I also have another outlet to communicate my appreciation and interest in certain brands. And if you’re still a little skeptical, as I was, check out this article: Common Sense Safety Tips For Foursquare. Follow some of those suggestions, hype up your security settings, use your best judgment and I promise you won’t be sorry you joined. Is Your Klout Score Just a Number? For those of you that aren’t aware, Klout.com measures your digital influence online and I, for one, had never heard of the social media tool until a few months ago. On the social site users sign-up, link their social media accounts and Klout spits out a score based on your presence and activity online. Upon first singing up, Klout rated me at a 22 and influential about 3 topics: Lebron James, Dwayne Wade and Pinterest. For anyone that knows me, this must be a mistake. Even though I didn’t exactly believe what the website was telling me, I still had the unconscious urge to increase my score. After exploring the About Klout page, I was reassured that my score was calculated by “a killer team of scientists and engineers working everyday to ensure continued accuracy and make the score clear and acceptable.” Yet, I still wasn’t convinced. So, I kept reading. Although this was informative, it didn’t fully reassure me that my score was accurate or believable. Then I happened to stumble across this article on Mashable: Klout Doesn’t Really Measure Influence. He believes these three key variables are missing in the complex algorithms, used by Klout and other sites, that calculate a corresponding number and neglect the importance of influence and relationships between people in social networks. Although I don’t see a monumental difference between “capacity to influence” and actual “influence” I still don’t 100% trust my Klout score and am skeptical of the website’s credibility. I think measuring someone’s social influence is like trying to measure someone’s love. It’s nearly impossible. There are various factors that affect your social influence online just as there are factors not easily measured that affect your love for someone and the type of love you have for that individual. So here’s my takeaway from the whole debacle: use Klout as a general foundation for exploring what topics of interest you have a legitimate voice in and which ones you could improve on. But, whatever you do, don’t get too hung up on increasing your score. Work on increasing your relationships online instead. On Wednesday, Facebook announced the launching of timelines for some brand pages and will be pushed to everyone on March 30th. Personally, I’m excited to see how brands will react. Most people hate when Facebook changes. And, from a social business standpoint, some people still aren’t using Facebook to it’s fullest potential. If that’s the case, I’m extremely curious to see how brands will utilize the new interface. That being said, it’s important to note the word “enhancement.” The new Facebook timeline will be an enhancement to brands; meaning the general purpose of a branded Facebook page won’t change. Facebook should still be utilized as a social media platform that engages consumers in a two-way conversation targeting an audience that is loyal or has interest in your product/service. The Facebook timeline, therefore, should be used to improve this goal. It is strictly a design and visual enhancement that will allow brands to tell a more authentic and engaging story. It’s how a brand chooses to tell it’s story that will make all the difference. I also believe it will make brands more personal for visitors. The interface allows for more prominent visuals and media, making it easier for brands that rely heavily on displaying their products or services to demonstrate the features and benefits of their products. The bottom line: more visuals and pictures will allow for more branding opportunities. In the first photo, you can see how Ben & Jerry’s was able to enhance their logo with the complimentary profile picture and cover photo. In the second image, you can see how they are taking advantage of the visuals to discuss new products and the story behind each flavor. Finally, in the third picture, you can see how they are using the timeline feature to tell its story as a brand and how it has evolved over time. With with this key benefit of improved branding, I believe the Facebook timeline will be a turning point for social businesses wishing to improve their presence and interaction with consumers on Facebook. Last week I discussed what a social media expert is. Today, I thought I’d look at the flip side of that spectrum and define what a social business is. According to socialmediabusiness.com, social business is like eating spaghetti with a spoon (http://bit.ly/wqIuvk) – I absolutely love this analogy. For most businesses, they “bite off more than they can chew” and “their eyes are bigger than their stomachs.” Although that’s a little cliche-overload, I believe it to be true. A lot of businesses want to be social. And who wouldn’t? It’s the latest and greatest trend. If companies aren’t even apparent on social media and making some sort of effort to be social, they’re considered out-dated and ancient. But, not all companies know how to effectively utilize the social media platforms with their marketing goals; hence the spaghetti analogy. Businesses see an appetizing plate of spaghetti, start swirling their forks to get a legitimate bite, end up eating half the plate in the first bite, chew and repeat. It’s a recipe made for disaster. Literally. What brands should do is strategize, implement, monitor and revise. Social media is an ongoing process that needs content organization, conversations with consumers, and up-to-date timely information. Taking the spaghetti analogy further, I believe businesses should take time investing in finding a good spaghetti sauce recipe, research the grocery store with the freshest products, take time and patience in making the gravy and slowly indulge once the pasta is cooked. So, while enjoying your pasta make sure to engage in conversations with your guests. You invited them over to dinner for more than a free meal. Show interest in their lives while also talking about your own life but don’t dominate the conversation or become too pushy. Social media is no different. Brands should follow similar communication norms as we partake in real life. Once the pasta is finished though, don’t stop there, remember to clean up the mess you left in the kitchen. Your spaghetti dinner doesn’t end once you’re done eating and neither should social media. Remember, it’s an ongoing conversation. Make sure to monitor negative WOM and clean up any messes that might inevitably corrupt. Maybe I went too far with this spaghetti reference… but blame my Italian roots – I can’t help it. Hopefully next time you decide to dive into a plate of spaghetti (aka managing a social media account for your business), make sure you remember my five key steps: strategize, implement, monitor and revise. As a gen Y/millennial kid, I’ve grown up in the digital age. I’d patiently wait for my computer to stop churning out strange, somewhat disruptive, dial-up sounds until I heard the precious sound I’d been waiting for: “you’ve got mail.” But just because I’ve grown up with the Internet, Y2K scare, emergence of MySpace/Facebook/Twitter does that make me an expert? I wish. Yet, the amount of job postings searching for media savvy individuals is increasing everyday. And they all want people like me; someone who has grown up in the digital age, understands it, and knows how to adapt it to fit their marketing goals. Do your research. Besides monitoring your client’s site make sure you’re also monitoring the competition too. What are they doing that you aren’t? What’s working? What’s not? What can you do to make your site better? CGC (consumer generated content) is key. Typically 3 posts a day are the sweet spot for engagement. Keep your target market in mind when scheduling your posts and don’t stop posting on weekends. Brands that don’t post at night or on weekends are missing out on prime engagement from consumers. Just because you work 8-5 doesn’t mean it’s ok to stop encouraging conversation with your fans. The conversation should be constant. Once the content is posted you really should continually gauge the content. When consumers ask questions, promptness is crucial in online customer service. Visitors are on your site for a reason so keeping them happy and informed is important. Make sure the information you are communicating is consistent across all social media platforms. As you expand, utilize Facebook for conversation starters and media sharing (pictures, videos etc.) and Twitter for time-sensitive content and updates. Each platform should have different content so you promote synergy and don’t become too repetitive. Now I’m no media expert, per se, but I hope these 4 tips are able to assist you at some point in your life. If this didn’t help you, try following – @DJenders, @AugieRay, @SarahVanElzen they are some real “social media experts.” And hopefully, together we can continue to learn from each other. Until then, stay tuned.